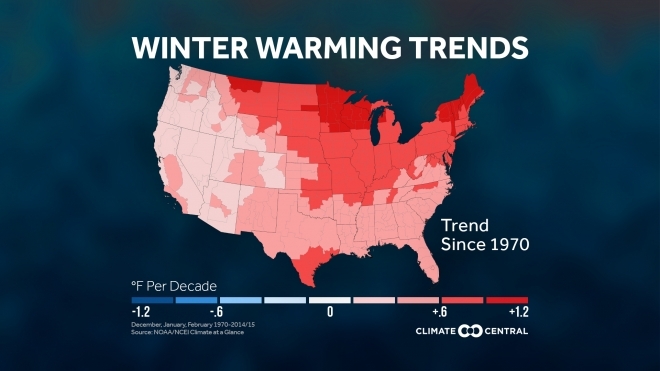 Climate Central published this map showing how Midwest winters are burning up since the 1970’s. As the world continues to warm from the increase of greenhouse gases, the amount of extreme cold during winter will start to decrease. According to a 2013 report by Climate Central, nationwide nighttime winter temperatures since 1970 have risen about 30 percent faster than nighttime temperatures over the entire year. Every NOAA climate division has shown warming, with the Upper Midwest, Great Lakes, and New England warming the most over the past 45 years. This is the standard climate fraud from people who are paid to lie about climate. They started their trend in the coldest decade of the temperature record. Had they started in any other decade and used the actual measured thermometer data, there would have been no warming or cooling. The warmest decade was during the 1930’s, and recent years are about 2C cooler. What’s interesting is this is a map from a 2012 Climate Central article. If you go to that, the color scheme has changed. It’s not all scary red anymore. You can also pull up the trends from 1912 to 2012 and it shows how well their cherry picking worked. The maximum increase in those 100 years was .5 degrees in North Dakota. Most of the rest of the States were negligible. First: I know it is all BS. Second: How is ‘warmer’ bad? (-25c vs -30c doesn’t feel ‘warmer’). And of course, one of the big problems with catastrophic predictions is that most of the “warming’ (such as it is) has occured on winter nights. Who believes that a huge (say, 5C) increase in winter night temperatures will cause melting glaciers, meters of sea level rise or flora/fauna extinctions? Hotter summer days might be catastrophic, not warmer winter nights. Denying the obvious cooling between 1940 and 1980 is an essential part of the global warming hoax. Winters 1977, 1978 and 1979 were the coldest three consecutive winters over much of the US. 1982 was not far behind.